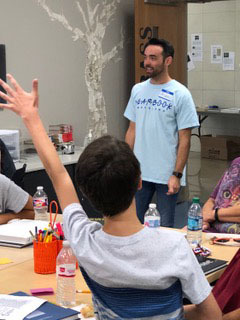 In only his fifth year on the job at Woodland Junior High School, adviser Andrew Young is proving that you don’t have to work with high school kids to produce award-winning yearbooks. 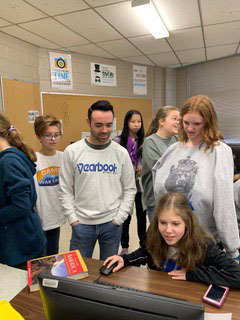 Under his guidance, the Round-Up yearbook has been named All-Arkansas by the Arkansas Scholastic Press Association (ASPA) and Young’s students have been frequent award winners on the state level. The 2018 Round-Up was recently named a Crown Finalist by the Columbia Scholastic Press Association. In 2017, Young was named a Rising Star by the Journalism Education Association (JEA). You can hear more from Young on his philosophies of teaching middle school yearbook, as he is a guest in a new episode of the Yearbook Chat with Jim podcast. Did you participate in journalism in high school? If so, what publication and role? I was a member of the Waldron High School yearbook my senior year. I was a staffer who took photos and designed spreads. Total number of books you have advised? I am currently advising my 5th book in total and they have all been at Woodland. What other activities were you involved in in high school? I was in choir and really involved in my church youth group. How did you decide to go into teaching and advising? I knew in about 6th grade that I wanted to be a teacher. It seemed like my teachers always enjoyed their job and it seemed fun. I had an amazing 10th grade Pre-AP English teacher named Mrs. Hunsucker, who made English fun. I remember her using the rap song “Grillz” by Nelly to teach figurative language. She rapped it in front of our whole class. It’s evident when a teacher loves what they do, and you could tell that from her. It was my favorite class of my entire high school experience. I never thought I would be a yearbook adviser when I started teaching. I had a good friend who was the yearbook adviser at Woodland and she had the opportunity to go to Fayetteville High School. She asked if I would take over the program. She told me she didn’t want to leave the program that she had worked so hard to build to just anybody. So, I agreed and became the Woodland yearbook adviser. How did you land at the middle school level? When I first started the MAT (Master of Arts in Teaching) program at the University of Arkansas, I thought I wanted to teach juniors or seniors. For some reason, I thought that is where all teachers wanted to be. Haha. Wow I was wrong. My first rotation as a student intern teacher was at Woodland teaching 9th grade English. I loved my mentor teacher and rest of the faculty. I also really liked the age group in the middle school/junior high. They seemed excited to learn and ready for anything. I had other rotations in high schools, but I knew I wanted to go back to the middle school/junior high. What was the most difficult part of your first year? I think the hardest part of my first year was just figuring out my managing style and my personality in my classroom. I had great intern teaching experiences, but those were based on someone else’s management style. It took a while for me to be comfortable managing students and over or under reacting. I loved my school and I loved the team I was on. I am very close with the other two teachers who also teach 8th grade English. We work very closely together. I don’t know how teachers make it without solid supportive teammates at school. I would drown. This year, I am mentoring the adviser of the other junior high in our district. Something I told her and would tell any first-year adviser is that you can’t do it all your first year. It’s easy to see amazing yearbooks and think that you are going to do all these things. It takes time, especially if you are transitioning a book from a scrapbook style to a true journalistic yearbook. Have one or two goals to focus on. That is what I did. I remember going to my first Walsworth Adviser Academy after my first year. I had a specific middle school track I was in and the adviser who taught it had a phenomenal award-winning book. I came back from that and told Jill Chittum, my rep at the time, that I wanted to move our book to a more journalistic book. She helped me and my staff make the goal of improving photography that year. Then the next year we improved design. Take it one step at a time. What have you enjoyed most about middle school advising? My favorite thing about advising in middle school is seeing students who have NEVER picked up a camera or designed anything create this great publication. When they take an amazing photo the first time and are so excited to come and show you, it is the best feeling. Since they have never done this before, they are open to anything and take constructive criticism very well. They also have a creative outlook on the design and don’t have any preconceived ideas about how it should look. As I am sure it is with most advisers, time management is the most difficult part. Since this is my staff’s introduction to journalism, I have to teach them everything about photography, design and journalistic writing as well as plan the book and start coverage. That can be a major challenge. Finding the time to teach the necessary skills and information as well as create the yearbook is hard. I also go to many of the events with them at the beginning of the year so I can help them if they need it (camera settings, where to stand, etc.). No year is ever the same. There is a different staff, a different theme and different challenges. No day is even the same. I like it because it’s exciting. Also, getting to see their faces and reactions at the book reveal is a big part of why I come back. Every year, there is someone that cries or comes really close to crying. It’s seeing the book in print that they have labored over for months all come together. It’s also inspiring because they always mention something about how they couldn’t have done it without everyone. It was a team effort. That makes me smile. Tell me about something in your adviser life that has made you proud. I won’t lie and say winning awards isn’t nice. It’s flattering and humbling. I’ve been named a JEA Rising Star, Arkansas Adviser of the Year and, most recently, was named Fayetteville Public Schools Teacher of the Year (due in large part to being Woodland’s yearbook adviser and the program doing so well). However, last year I received a text from a former a staffer who continued in journalism on the high school yearbook staff. She said “Guess what!! I realized this summer that pursuing photography is what I want to do! So I’m looking into journalism colleges. So THANK YOU SO MUCH for putting me in yearbook and teaching me to do what I love!! !” Awards are nice, that text was priceless. It definitely makes me feel like I have made a difference. What goals have you set personally and for your program? I want our yearbook to improve every year. I love getting critiques from CSPA and NSPA because it gives us specific things to work on. The staff use them to make goals for the book every year. I set a goal 4 years ago (after my first year) to make our book more journalistic and award winning. For me personally, I want to continue to be involved in the Arkansas Scholastic Press Association (right now I am the secretary of the executive board). Through my position with ASPA I want to get more junior highs and middle schools involved in the association and creating amazing yearbooks. I want to do this at the national level as well. I was recently chosen as a Differentiation Editor for the JEA Curriculum. My job is to help create content and revise existing content to make the curriculum more accessible for middle schools. I just want middle schools and junior highs to see that it is possible to produce great books. Tell a story about a moment in your career as an adviser that you will never forget. My all-time favorite moment as an adviser (so far) has been the reveal dinner for my second staff/yearbook. It was the first year we tried to create a more journalistic book, and I set some high goals for them. Every year when the yearbooks come in, I hide them from the staff. I take the staff’s books home and I wrap them in wrapping paper. They chose a night and a restaurant. We all get dressed up and go to the restaurant to have dinner. I tell them they can say whatever they want to about the year or the other members of the staff, then they can open their books. This was an eclectic staff with several different cliques of students. That night, a couple of the staffers made “awards” for everybody and said nice things about each member. While that was happening, students were crying and kept saying “thank you, thank you.” When they opened their books, almost everyone started crying. I had never seen anything like it. There were no more cliques or groups, just one yearbook staff who was so happy and proud about what they created. Tell me about some of the awards you have recently won. Both personally and with the staff. Me: ASPA Adviser of the Year and Fayetteville Public Schools Teacher of the Year. Both of these awards mean a lot to me, and I am very honored by them. The ASPA Adviser of the Year is a funny story. I was asked about a month before the convention to step in as secretary, as the other one had resigned. I agreed to join the board. The night before convention I helped the director print awards and put them in plaques. I knew I had been nominated and I submitted materials. While I was putting awards in plaques, I saw another adviser had won Adviser of the Year. The next night at the banquet, they began describing the Adviser of the Year and it sounded like stuff I was doing. Then they announced my name. The other members had hidden my certificate so it would be a surprise and I was shocked! Haha. The FPS Teacher of the Year meant a lot because my colleagues at my school voted me as our building teacher of the year. Then district administrators read our applications and selected me for the district teacher of the year. To be thought of so highly by your peers and your bosses is a great feeling. YB Staff: CSPA Crown Finalist, Gold Medalist from CSPA, All-American with 4 marks of distinction from NSPA, NSPA Photo of the Year Finalist Finn Lawless, NSPA Photo of the Year Finalist Rose Long, NSPA Design of the Year Finalist, Ariadna Ramirez. I am really excited about the Crown Finalist announcement. It’s the most recent and it’s the first time in our publication’s history to reach this level. The All-American with four marks of distinction is special to me, because we did an NSPA critique the year before where we received a First Class with two marks of distinction. I had last year’s staff take that critique and make goals for each section. The All-American shows that my staff accomplished those goals and we grew from that critique. I will forever be an advocate for critiques because it truly helps you grow.